Kathleen Kendall-Tackett, a health psychologist and specialist in women’s health, is invited to speak at the U.N. Status of Women conference in New York City. Dr. Kendall-Tackett is Editor-in-Chief of Praeclarus Press and will present on how violence and adversity impacts women's risk of heart disease, diabetes, and obesity. Psychological trauma increases women's risk for heart disease, diabetes, and obesity. On March 16, Dr. Kathleen Kendall-Tackett will present at United Nations Commission on the Status of Women event on Violence, Crises, Adversity, and Non-Communicable Diseases at the UN Headquarters in New York City. Dr. Kendall-Tackett is Editor-in-Chief of Praeclarus Press and specializes in women’s health research and the health effects of psychological trauma. She is the author or editor of 35 books including Treating the Lifetime Health Effects of Childhood Victimization, Trauma and Physical Health, and the Health Consequences of Abuse in the Family. Dr. Kendall-Tackett’s presentation will focus on how trauma impacts risk for heart disease, diabetes, and obesity. Women who have experienced adversity, violence, or abuse, particularly during childhood have a higher risk for heart disease, diabetes, and obesity. The UN event will focus on women’s health and well-being examining the impact of conflict, violence, adversity, and stress on health and well-being of women and children. It is important to note that not only do conflict and chronic stressors impact current health, but research now shows that it has detrimental impact on children’s development and contributes to the development of chronic health conditions later in life. Therefore, achieving the highest level of health and well-being requires a multi-faceted approach. This is especially true for women and had implications for women’s empowerment and sustainable development. Participants in this event will include the Ambassadors of Jamaica, Belgium, Thailand, and the Executive Director of the WHO Office in New York. Representatives from Palau and Ukraine will also participate. Dr. Elizabeth Carll will serve as moderator. The event will takes place Thursday March 16, 3:00 to 4:15 pm in Conference Room A at the UN Headquarters. 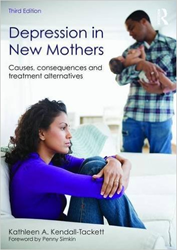 Praeclarus Press is a small press specializing in women’s health throughout the lifespan, and includes titles on maternal depression, trauma, PTSD, and breastfeeding. Praeclarus Press based in Amarillo, Texas.